Finally, it was my first time at MTV World Stage. I was actually pretty excited when I got the opportunity to attend this eventful concert – getting to see celebrity artists live for the very first time. Yeah, damn! 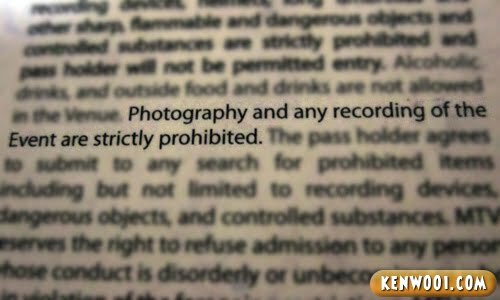 Photography and any recording of the event are strictly prohibited. It’s printed at the back of the ticket under the Terms & Conditions section. So how am I suppose to blog bout MTV World Stage if photography is strictly prohibited? Experiencing it is nothing if I can’t share on my blog. 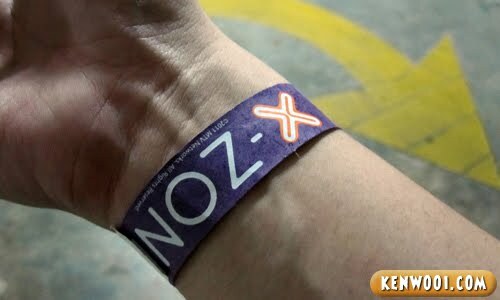 Anyway, since I have the X-Zone tickets, I get to be stationed right in front of the stage! Woohoo! Well honestly, I wanted to smuggle in my compact camera (didn’t bring DSLR because it would be too obvious!) into the concert. I had plans to sneak it in. But looking at the tight security at the registration entrance, I decided to leave my camera in the car. So sad right? At the registration point, there were many confiscated items – such as water bottles and long umbrellas. So this is the last good quality photo I have featuring the concert. Be prepared to embrace the not-so-good quality photos taken from the lousy camera on the phone. 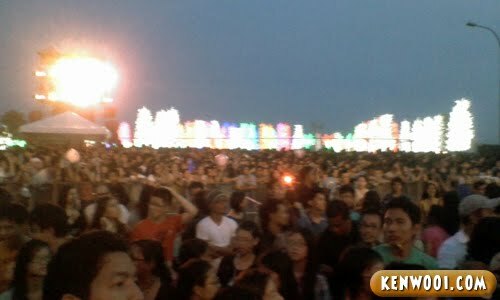 Alright, once in the concert vicinity, there were already a massive crowd even though the concert hasn’t started. 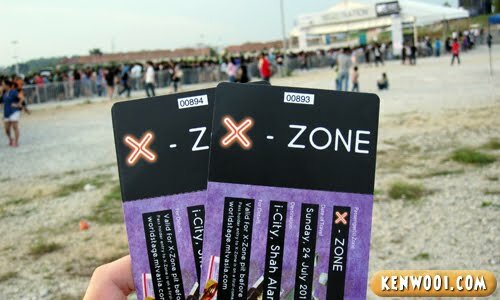 The regular section was really packed, but lucky for me – I get to go into the X-Zone. 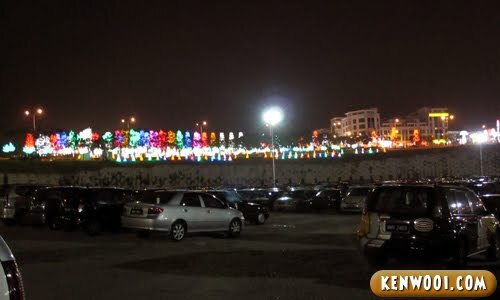 Here’s the view of the enthusiastic crowd behind accompanied by lighted tree decorations at i-City Shah Alam. Anyway, let’s continue. The crowd were exhilarated from the start. People screaming, singing and dancing to the tune when the first act started. First up, it was Pop Shuvit, our very own Malaysian group. They started the show with a bang and loud songs made the crowd go wild! No doubt it was the only act that really gave us the oomph! When they finished their performance, Beast came next but we waited quite long during the interval. Not sure why – probably the Korean dudes were still putting on their make up. 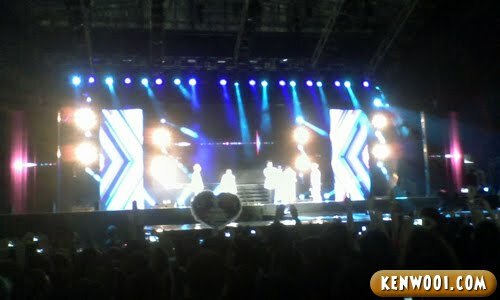 But once the beastly Korean pop group appeared on stage, the fans went frenzy – especially the ladies! To be honest, I think they have a lot of fans, everyone seem to be cheering so gleefully when they perform. Or perhaps the chicks dig cute Korean guys. Too bad I don’t appreciate Korean pop though. 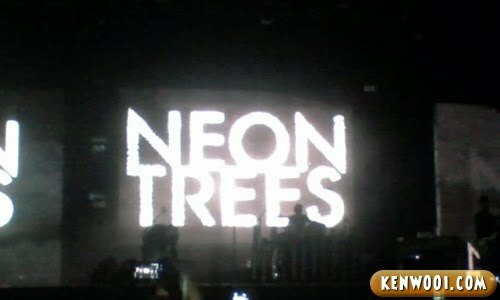 The 3rd act, definitely my favourite was Neon Trees! An American alternative rock band from Utah, their main vocalist Tyler made the audience sway to his music. Neon Trees’ hit song Animal was definitely the rockiest song of the night as the crowd enthusiastically sang and jumped along! Last but not least, 30 Seconds to Mars. Another rock band, but since I don’t listen to them and don’t wanna get stuck in a jam when everyone leaves together, I decided to leave after their 1st song. After leaving, it was 30 Minutes to Home. Smooth ride home. Overall, MTV World Stage was awesome. Despite not having a great lineup as compared to the previous 2 installments, the atmosphere was absolutely phenomenal and the audience were such great people. 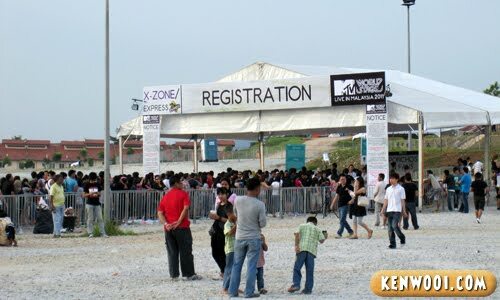 The bands actually performed at their best – well, maybe because it’s gonna be broadcasted on MTV channel. Despite the good points, the intervals between the performances were quite lengthy. Waiting wasn’t fun and it just made us bored – since we had nothing to do but to wait. This photo was taken after I left and was at the car park area. One last shot of MTV World Stage with i-City! Anyway, freebies given out were a hand fan and a raincoat. Fortunately it was a good weather and we didn’t have to use the raincoat at all. So yeah, that’s roughly all. 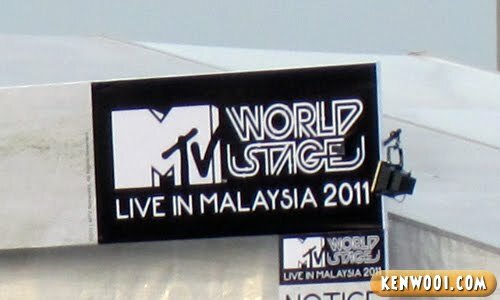 Oh by the way, in my MTV World Stage preview entry, remember I mentioned that a newcomer Malaysian artist might perform an encore? Yes, it’s Ken Wooi and he DID make an appearance right at the end! Woah, his name shining so brightly on the big screen! Sorry, I couldn’t take a close up photo of him because my camera on phone noob. Wait a minute, you said “No”? 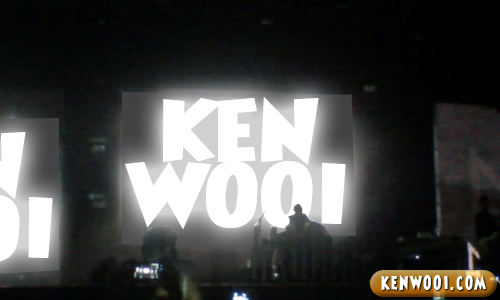 Ken Wooi didn’t perform at the end? I’m sure he did! It’s either you went back early or you were probably still crazy over Jared Leto from 30 Seconds to Mars lah. But here’s another proof…! See his face, so hensem displayed on the screen some more! The chicks went ecstatic over him too, no doubt about that. say what? 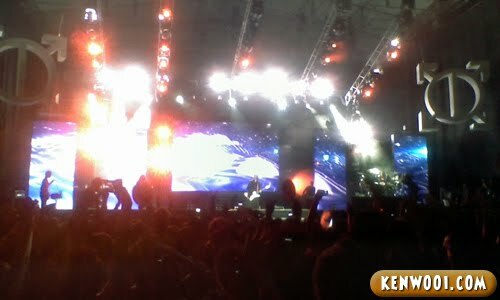 30 sec to mars is one of the greatest band, thus it was the best lineup ever! I totally forgotten to mention about the fan and ponchos and no photography. Went for the first one. Never again. Too old liao. You should’ve just snucked in the digital cam la – it’s expected. They only don’t want you to record cos they’re recording it for TV. Don’t bring DSLR can already. I brought my cam for last year’s. Heh. :P they don’t really mind. I don’t think I can ever attend a concert where Korean boybands perform again. The last time I was at a concert where CN Blue and Super Junior perform, the crowd was so noisy I had to cover my ears throughout the concert! Crazy! Oooooo….30 seconds to Mars! I like. But I think I prefer Muse or the Killers. LOL!!! i heard 30 seconds to mars are amazing to watch live, the energy they bring is crazy. its sad u left early to avoid the jam, but expected la if you live in KL. :P Wouldn’t want to be stuck in the jam too! 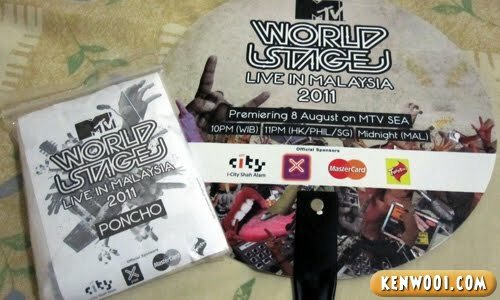 did u get free tickets to watch mtv world stage?? It was raining last year and the year before, so I never get to keep the poncho. Anyway, digital cameras are actually allowed in :P So nice you get to join this year! Lol the term and conditions is so long :D nice show! nice ken!!! 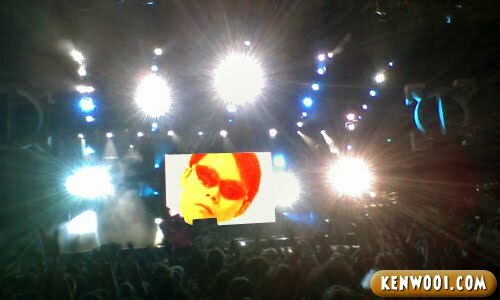 although i am dont have chance to go…well may be next time…but u give a huge photo through this blog…wallah…NICE !!! Good experience there. Wish I could go to but it looks kind of crowded. Neon Trees was awesome! LOVE them!!!! 30 seconds to Mars was damn good too! You should have stay till the last and encore song!!! I can imagine how great an experience it must have been but I can’t take big crowd most of time. damn! i wish i could go for the concert! wtf ken. didn’t know u were famous. LOL. 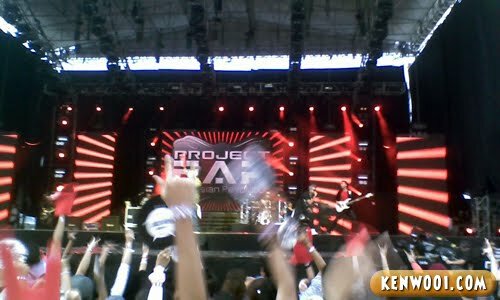 Eventually, you managed to take photos as well at the concert but some poor quality. Even you are with some high tech phones, the image quality is also not up to the mark. A phone camera can never compare with a truly camera in all aspects, agree? The intervals are long because there is only one stage and different band uses their own equipment for their own performance therefore the dismantling and assembling of the drums, guitars and microphones takes time. 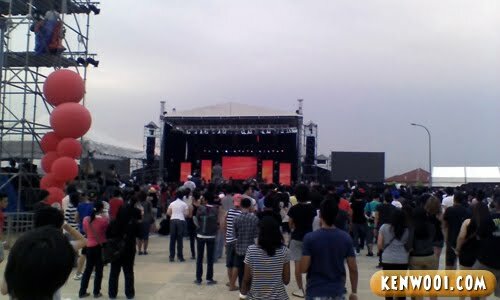 In addition they need to conduct a short sound check to ensure that the equipment is according to their specifications. I went to MTV Worldstage last Sunday too! OMG it was the best… but I was at the VIP area so I couldn’t see Jared upclose.. so sad :(… but yeahh, it was definitely great to see 30STM perform live! I bet the crowd went ballistic when you went on stage….hahaha good one!